Precise identification of the two species shown on this page is difficult because the two species are morphologically quite similar and because they hybridize. 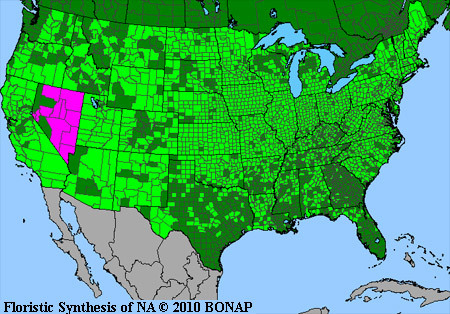 Intermountain Flora notes that the genus is "perplexing ... due to considerable range of variability, which can be inferred from the long lists of synonyms. [Edwin] Greene alone proposed more than 65 [names for the three species in our area.]" A. androsaemifolium flower petals are 3-4 times as long as the calyx, about 5/16" long; petals of A. cannabinum are 2-3 times as long as the calyx, about 3/16" long. A. androsaemifolium flower petal lobes tend to reflex; petal lobes of A. cannabinum tend to be upright or horizontal. A. androsaemifolium leaves tend to droop and be egg-shaped, and they are about twice as long as wide; leaves of A. cannabinum tend to be horizontal and they are about three times as long as wide. Bobette Douglas of Cobb, California, emailed me her observations about another set of characteristics that helps separate these two species: A. androsaemifolium petioles tend to be in line, i.e., they are attached to the stem directly above and below other petioles. A. cannabinum petioles tend to be attached to the stem 90 degrees around the stem from the point of attachment of the petioles above and below them. 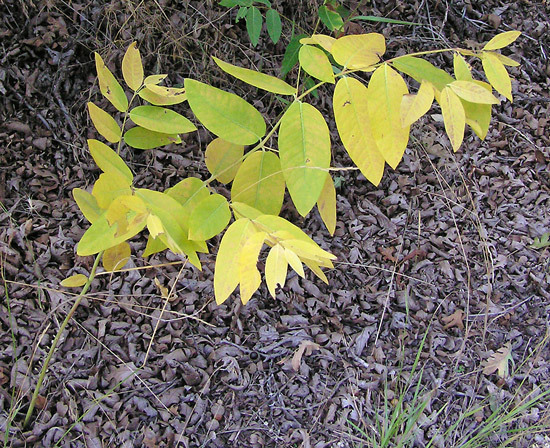 A. androsaemifolium seed pods are about twice the length of its leaves; seed pods of A. cannabinum are more than three times the length of its leaves. Linnaeus named the Apocynum genus in 1753. 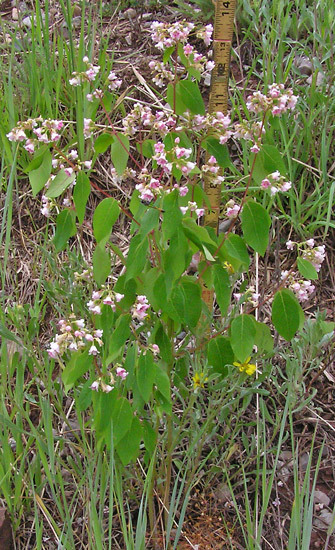 "Apocynum" is Greek for "away dog", i.e., "dogbane". 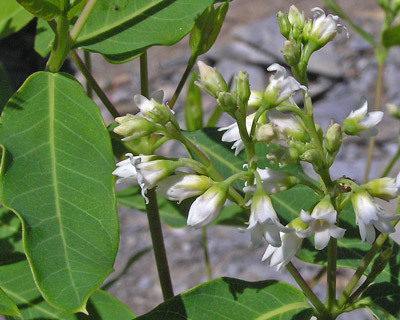 Extracts of the plant were used as poison to kill wild dogs. Foothills, montane. Meadows, moist woods near streams, roadsides. Spring, summer. Roaring Fork Road, July 7, 2006. 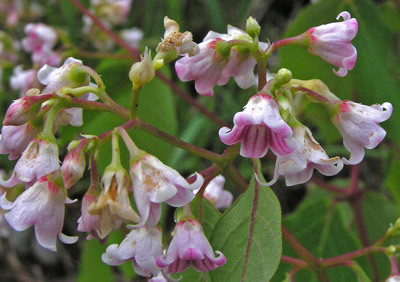 Drooping leaves and a pink corolla help to set this species apart from the next, but the two species hybridize making precise identification difficult. Generally this species is found on rocky, gravelly soils and the next along streams and washes. In 1753 Linnaeus named this genus and species. In the following 150 years the plant endured dozens of name changes. "Androsaemifolium" means "with leaves similar to those of the genus Androsaemum", a name once given to the genus that we now call "Hypericum". The flowers are quite small but in eye-catching clusters. Lone Mesa State Park, July 2, 2008. 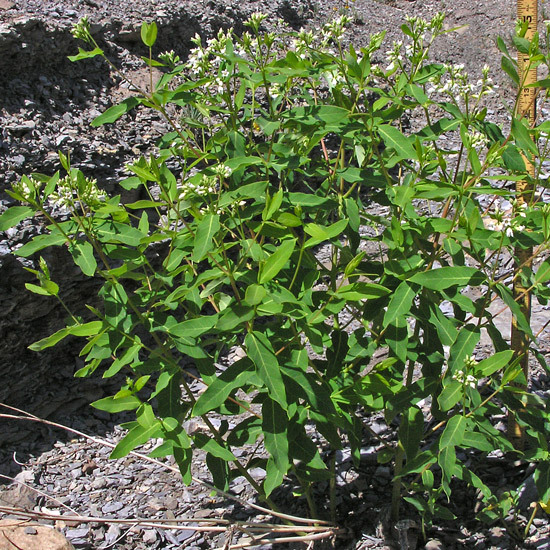 This is a fairly common but greatly overlooked plant even though it grows to about two feet tall in thick patches (from underground spreading roots). 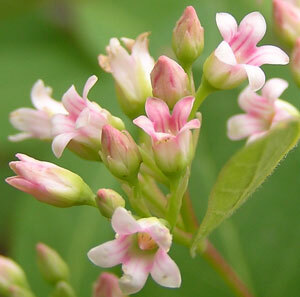 It has a very erect and open, airy growth pattern and tiny, but quite elegant white-to-pink flowers. Linnaeus named this genus and species in 1753. "Cannabinum" is Greek for "hemp"; the fiber of mature Apocynum cannabinum was used for cordage. 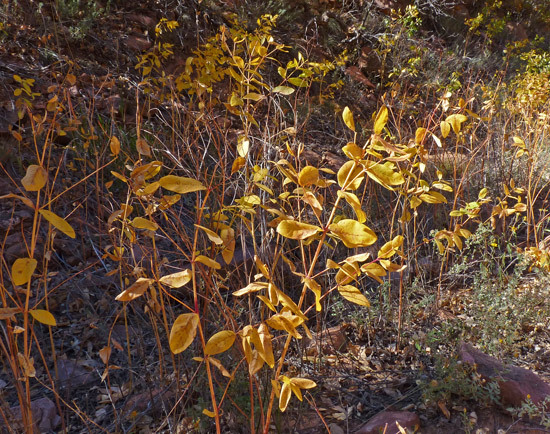 Lower Dolores River Canyon, May 17, 2004. Piedra River Canyon, August 20, 2005. Long, narrow seed pods emerge from the tiny flowers. Lower Dolores River Canyon, September 12, 2005 and October 8, 2012. Lemon-yellow and then golden fall colors attract attention to Apocynum cannabinum plants which often go unnoticed during the summer.